Computers are the best invention of this world. They have made the continent a global village, of course with the help of the internet. Shout outs to tech giants, Microsoft and Google. Computers aren’t smart though. They can’t draw pictures or wash your car. If you asked your computer to drive your truck, it wouldn’t understand what you are saying. You have to explain everything carefully, or it will make mistakes. Computers understand languages like Java, Python and C programming. You are about to learn the basic computer programming for beginners. Computer programming is defined as the act of performing computer programs which are a set of instructions written through the use of Computer Programming Language to perform a particular task by the computer. Computer programming is not only fun but it also easy to learn as long as you adopt the right approach. You need to learn the basics of computer programming through a simple and a really practical way for your own benefit as a beginner. Novice learners who are willing to learn the basics of computer programming but haven’t had the opportunity and proper guidance can learn a few things here and study some from the site we will recommend. We are confident that after you put your attention to it and reach a level where you can quickly code in C Programming, you will have a deeper understanding of both Python and Java programming languages and you will be able to proceed further. If you are new to computer programming, it is important to read tutorials twice or sometimes thrice to understand. Reading a tutorial for the first time will not create that much idea in your head, but from the second reading you will begin to understand most of the concepts, and you will have fun writing computer programs. What you need is some exposure to computers and you are used to the keyboard, printer, screen, and the mouse. You will learn what the terms above mean and then understand how they can be used in various programming languages after picking a course. You need to understand C before proceeding to similar concepts like Python and Java. Python is recommended for beginners, and it’s a very popular computer language taught in U.S. universities. Python is used to make desktop apps as well as web apps. Moreover, Python is also popular in many academic communities. Google, Instagram, Reddit, and Dropbox were built with this program. Ruby was developed to allow developers to have fun and be productive. Most people would recommend you to learn Ruby as the programming language that you learn first. It has been used to create sites like Shopify, Airbnb, Hulu, and Slideshare. Java is the one used to build Android apps, games, and desktop apps. Java also has a Hadoop framework that is Java-based and has been used to build apps like Amazon Web Services, Yahoo, and Facebook. 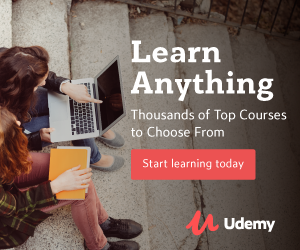 Udemy is an online platform where you can study anything, at a small fee. Want to know how to wash your dog? Don’t worry. Create an Udemy account, log in, pay a few bucks and a tutor will be more than willing to take you through the whole process from which type of soap you should use to the amount of water, etc. In short, there are millions of courses offered there, including business management courses online and it is the biggest of its kind. There are course instructors who take you through the whole process until you are good to go. They work hard to ensure that students have a favorable learning experience. There are also some teaching assistants to help you answer any questions you might have. The greatest thing about Udemy is that you can access courses from different platforms. You can access from your phone through the app, smart YV, or PC. Also, different ways of payment are supported depending on the platform you are using. You can add your course to your wishlist easily and take the course later on. The course can either be free or paid for. You start by browsing the course, click or tap the heart that you see besides “Add to Cart,” and the course will automatically enter your wishlist. Before taking this course, you don’t need any programming experience. You only need to be familiar with your PC. The course will introduce you to the fantastic computer science world. Tech industry is a trending field and learning how to program is a great decision. Even though the course won’t make you an expert or pro, but it will give you the first-hand experience and a foundation from where you can advance. The course is suitable for students with zero programming experience, wants to learn about coding, and programming but have no idea of where to start. To take this course, you should possess computer knowledge and be able to create a folder, run the software, and save files. The course is for those who want to learn computer programming but have in one or other way been frustrated by college books or courses. Students in this course learn the way basic code editor is used, variables, variable types, and conversions, condition statement and Boolean Logic. They also learn about lists, repetition using nesting loops, string processing, functions, and random number generation. At the course, 15 assignments are given, and there is a video for every assignment showing solutions for the assignment. All the assignments given are text-based so that student can focus on learning and building a strong foundation for advanced programming. They recommend anyone above 14 years for this course. You are required to have a computer to take this basic computer programming for beginners, and you must also have an interest in Computer Science. The topic of Computer Science is becoming more relevant with time, and computer programs are in every place. We also use the software in our phones and control our appliances with our smartphones. But not many people understand how this works. This course will ensure you understand the concepts of computer science as well as programming languages. The tutor uses various examples to ensure the course is entertaining. You will also learn and understand the importance of algorithms. The tutor will also educate you about different approaches to programming. So, if you are curious about how computers function and what a programmer usually does, you can join the course. You only need a computer and the willingness to explore new stuff. This course will take you through the fundamental concepts about programming, and the concepts are common enough such that you can find them in any programming language. The course exposes you to Pseudo codes, Flow Charts, and Algorithms. It also helps you to be familiar with the terms in programming languages. The course is recommended for both children and adults. This course helps you lay a solid foundation and educates you about the concepts of programming as it prepares you to take programming head on. If you are new to the art of programming, this course is for you. Before enrolling on this course, you need to have basic PC knowledge and skills, a pen and a paper, open mind and a programming language that you will have downloaded, patience, and perseverance. The course is designed to expose the basics of computer programming, offering a solid basis enabling you to learn new programming languages. Many programmers can write software, but it takes practice to perfect that. The course is for those people who are still in the dark as far as programming is concerned, people who have a little grasp, and those who want to set their foundation in programming.